Late gadolinium enhancement in hypertrophic cardiomyopathy: When should we use it in risk stratification of our patients? 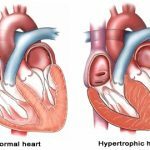 Hypertrophic cardiomyopathy (HCM) is associated with complications including heart failure and sudden cardiac death (SCD). The implantable cardioverter defibrillator (ICD) reduces risk of SCD and provides primary prophylaxis for selected patients. Current risk stratification strategies include traditional and novel risk markers. In the United States, presence of ³1 traditional risk marker is sufficient to consider ICD implantation: family history of HCM-related SCD ³1 close relative; unexplained syncope; massive left ventricular (LV) hypertrophy (wall thickness ³30mm); repetitive or prolonged non-sustained ventricular tachycardia; and/or attenuated or hypotensive blood pressure response to exercise. (1) In Europe, an HCM risk calculator including additional parameters (left atrial size and LV outflow tract gradient) has been developed to estimate the SCD risk at 5 years and provide ICD implantation advice. (2) Late gadolinium enhancement (LGE) demonstrated on cardiac magnetic resonance (CMR) imaging has been shown to represent myocardial fibrosis. There has been considerable interest in the role of LGE in HCM risk assessment, but the prognostic importance has been controversial. In the most recent meta-analysis published in JACC imaging, Weng et al. have pooled data from almost 3000 HCM patients representing the largest combined experience to date. (3) LGE was present in 55% of HCM patients. Although presence of LGE was associated with increased risk for SCD (OR 3.41; 95% CI 1.97-5.95; p<0.001) and a trend towards increased heart failure death (OR 2.21; 95% CI 0.84-5.80), the high frequency of this finding limits its role as an independent risk marker or as a practical strategy for clinical decision making. More relevant appears to be the extent of LGE. Extensive LGE conferred greater SCD risk and there was a linear relationship between LGE extent and risk (adjusted HR 1.36; 95% CI 1.10-1.69; p=0.005 for each 10% increase in LGE as a proportion of LV mass). Present guidelines do not include LGE as a risk marker in HCM but there is increasing evidence for its role. It has been suggested that in borderline risk assessment cases, extensive and diffuse LGE may help arbitrate in favour of ICD implantation. Gersh BJ et al. 2011 ACCF/AHA guidelines for the diagnosis and treatment of hypertrophic cardiomyopathy. J Am Coll Cardiol 2011;58:e212-60. Elliott PM et al. 2014 ESC guidelines on diagnosis and management of hypertrophic cardiomyopathy. Eur Heart J 2014;35:2733-79. Weng Z et al. Prognostic importance of LGE-CMR in HCM: A meta-analysis. JACC Cardiovasc Imaging 2016 Jul 19 (Epub ahead of print). The histopathological hallmarks of hypertrophic cardiomyopathy (HCM) are myocyte hypertrophy, myocyte disarray, different types of fibrosis and small- vessel disease. Late gadolinium enhancement (LGE) detection by CMR has been postulated to be a detector of localised areas of myocardial fibrosis. LGE is not a good detector of diffuse fibrosis. Replacement scarring is seen in ischemic processes and it has shown to be associated to increased risk of arrhythmias and adverse events. The percentage of replacement scarring detected with CMR LGE in HCM is not known. RV insertion points LGE often reported in HCM patients, is likely to represent areas of expansion of the extracellular volume (ECV) rather than areas of replacement fibrosis. The dynamic behaviour between hypertrophy, ECV expansion and replacement fibrosis over time is not completely understood. How those interactions translate to disease expression at the time of disease onset, what proportion of the responses are genetically determined and what remodelling type is followed after stresses like athletic training, hypertension, left ventricular outflow tract obstruction or increased adrenergic status are still matters of research. CMR has made evident in the in vivo subject what it is known in the post mortem subject; that fibrosis is common. How LGE can help in differentiating those individuals at risk of sudden cardiac death in a condition with such a low global sudden death event rate with such a broad presentation across the whole lifespan is a question that still needs an answer. Recent meta analysis of a large number of HCM patient using rather heterogeneous base line data sets and different LGE acquisition and reporting methods suggest that when the myocardium is largely substituted by scar, sudden death events and heart failure progression and all cause of death are more common. Is this a way of saying that more advanced disease has globally worse prognosis? It seems that this concept has been accepted in everyday practice. The extent of LGE is however is far from being an accurate and robust determination. Local inter and intra observer validation should be considered when using strict cut off points as low as 15% for significant LGE. The length of follow up in the CMR studies is still a major limitation and long term validation is needed to put the results into context. Combined emerging techniques in CMR trying to detect diffuse and replacement fibrosis are very much welcomed to improve the detection of early disease changes identifying a group of patients that could potentially benefit from novel therapies.